In the year 1976, by the order of the executive yuan, this institute accommodates the government’s policy to carry practical economic diplomacy execution. This institute found that the knowledge level of all nations on international market, investment analysis, and intellectual property is not enough; therefore the development of the economy and investments are limited. By referring to the organization, system, and regulations of the research institutes of developed countries, this institute (Juridical Person China Industrial and Commercial Research Institute, formerly ‘China Industrial and Commercial Research Institute’) was established by the order of the Ministry of Education in 1981, and has become one of the 19 high academic institutes in Taiwan. This institute has always kept the founding mission statement: ‘Professional, Academic, Authoritative’, and performs many kinds of research, development, and technical exchanges, both domestically and internationally. We also help industries with human resources training, estimating and researching, inspecting and value adjustment, technical consultancy , certificate issuing, and publishing, and to help industries successfully develop investments by providing assistance with business operation. Recently, our scope of research extends to the industry development between Taiwan and China, and the researches of the economic development of Shanghai and intellectual property right. 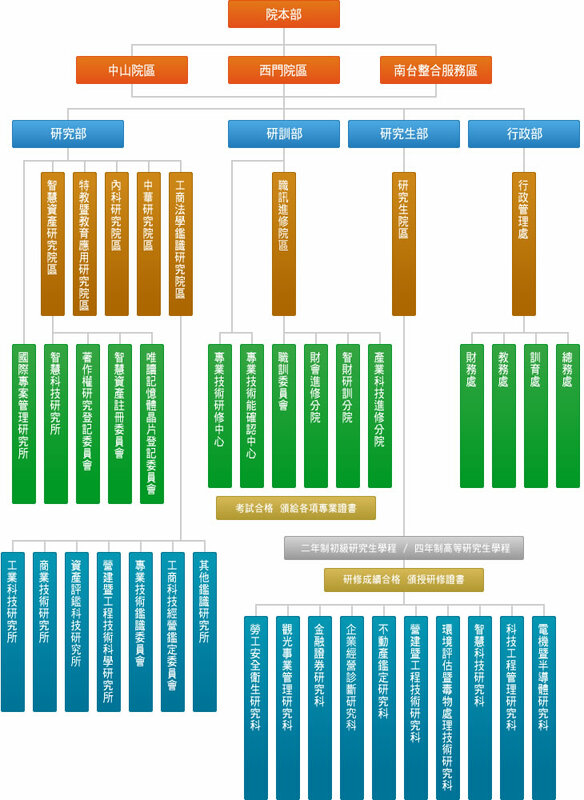 We also active on establishing communication for the industries and academics in Taiwan and China, and expect to become the best researching institute for industries. We also expect to provide high-level technical researching capability for industries in Taiwan, and help the modernize of Taiwan’s economical development, to achieve the founding mission statement of this institute. Acknowledged business operation diagnostician, Acknowledged business operation diagnostician, 2-year postgraduate courses, 4-year postgraduate courses, designs and executes the research plan for the industrial, designs and executes all kinds of on-job training, postgraduate international support training. Professional Qualifications: Holds professional qualification examinations, and issuing acknowledged Chinese-English Certification. Acknowledged Business Operation Diagnostician Certificate Registry: Holds business operation diagnostician qualification or examination of every levelQualified personnel will be issued with ‘Acknowledged Business Operation Diagnostician Certificate’, and is able to register with the operation diagnose research committee as ‘Acknowledged Business Operation Diagnostician’, to join our practical experience announcement and researches forever. Diagnose and guidance services for business operation and quality management.Diagnose and guidance services for intellectual property and information security.Diagnose and guidance services for technology upgrade and transfer.Diagnose and guidance services for financial plan and risk management.Diagnose and guidance services for human resources and customer relationship. Arrange, examine, and publish services for academic articles.Publishing professional books and teaching materials.Assists book ordering and selling.Edit postal tuition teaching materials and examination book. Enhance the marketing of products by all aspects. 1. The supreme industrial research facility approved by government in Taiwan. 2. Helps all levels of court of judicial facility to perform commercial and industrial assessments and adjustment research, the reference materials of judicial judgment of this institute were most accepted by courts. 3. The research facility with most branch offices, our service network reaches everywhere in Taiwan. 4. The most practical and civil-friendly research facility in Taiwan. 5. Co-operates with Ministry of Economic Affairs, Industrial Development Bureau, Small and Medium Enterprise Administration, Taiwan Business Bank, Taipei Business Bank, Taiwan Inventor’s Association, National Association of Small and Medium Enterprises R.O.C. to give speeches or activities. 6. Consigned by Ministry of Economic Affairs to compile enterprise diagnose and practice techniques. 7. Consigned by Ministry of Economic Affairs to compile ‘Value estimating system and finance system connecting conditions, with the research plan of co-operate measures’, and ‘Professional research course of the service techniques of intellectual property value estimating’. This institute is the professional facility of intellectual property value estimating in Taiwan. 8. Making value estimating plans of intellectual capitals and techniques of National Aerospace Industrial Development Corporation (Plans of becoming private for 5 business units). 9. Approved by the clean room establishing plan of ‘advancing the cooperate competitive of manufacturers’ of MOEA IDB. 版權所有 © 2019 財團法人中華工商研究院. All rights reserved.